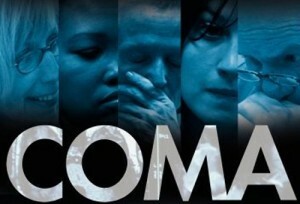 What is a coma? What is a “vegetative state”? What is the possibility for consciousness after emerging from a comatose state? What, in the end, makes life worth living? According to the Brain Injury Association of America, traumatic brain injury affects more Americans each year than breast cancer, multiple sclerosis, HIV/AIDS and spinal cord injury combined. Academy Award®-nominated director Liz Garbus’ insightful documentary COMA explores the mysteries of the injured brain and its ability to heal. Giving voice to people whose quality of life and very existence have been threatened, the special goes inside a top U.S. medical facility for the treatment of head trauma and follows four coma survivors over the course of a year. In the wake of the Terri Schiavo media spectacle and the “awakening” of Terry Wallis from a minimally conscious state after 19 years of silence, Garbus strives to find answers away from the glare of the media. With unprecedented access to the Center for Head Injuries at the JFK Medical Center in Edison, NJ, she chronicles the emotional stories of four families for one year, looking through the eyes of their renowned physicians and neuropsychologists, led by Dr. Joseph Giacino and Dr. Caroline McCagg. As Garbus documents the care and treatment of the four individuals, each emerges from coma either to regain consciousness or to remain trapped, perhaps indefinitely, in a vegetative state. For the vast majority of patients, the first year is a critical window of time for recovery; most doctors agree that after a year, chances of progress are slim to none. Each patient’s progress is the source of the joy and sorrow of the ever-present family members, who have put their lives on hold to become caregivers. Liz Garbus co-founded Moxie Firecracker, Inc., an independent documentary production company, with filmmaker Rory Kennedy in 1998. Her directorial credits include “The Farm: Angola, USA,” which was nominated for an Academy Award®, and won two Emmys® and the Sundance Grand Jury Prize; “The Execution of Wanda Jean” (HBO); “The Nazi Officer’s Wife” (A&E); “Girlhood” (Wellspring/TLC), “Xiara’s Song” (Cinemax), and was one of the directors of HBO’s “Addiction” series. In 2007 Garbus and Rory Kennedy executive produced the Academy Award®- nominated “Street Fight.” Most recently, Garbus produced and directed “Shouting Fire: Stories from the Edge of Free Speech” (HBO), it premiered at the Sundance Film Festival in January 2009.